When I first saw that this month’s challenge for We Should Cocoa (hosted by JibberJabberUK and led by Choclette of the Chocolate Log Blog), was chocolate and vegetables, my initial reaction was: “Goodness, what on earth am I going to make for this?” After a brief moment of reflection, I realized that there were plenty of good options out there—chocolate and zucchini, chocolate and pumpkin, chocolate and beets—but unfortunately, they all seemed to point towards cake. And since I had made cake for last’s month’s “Showstopper” challenge (which you can read about here), I wanted to do something different this time around. Then I remembered a variation for sweet potato brioche that I had stumbled across in Rose Levy Beranbaum’s Bread Bible a few weeks ago. She had said that the sweet potato gave the dough a beautiful golden glow. The concept intrigued me, and I had decided that I would try making a sweet roll along those lines in the future. Well, the future seemed to have arrived. Chocolate and sweet potato sounded like a wonderful match. 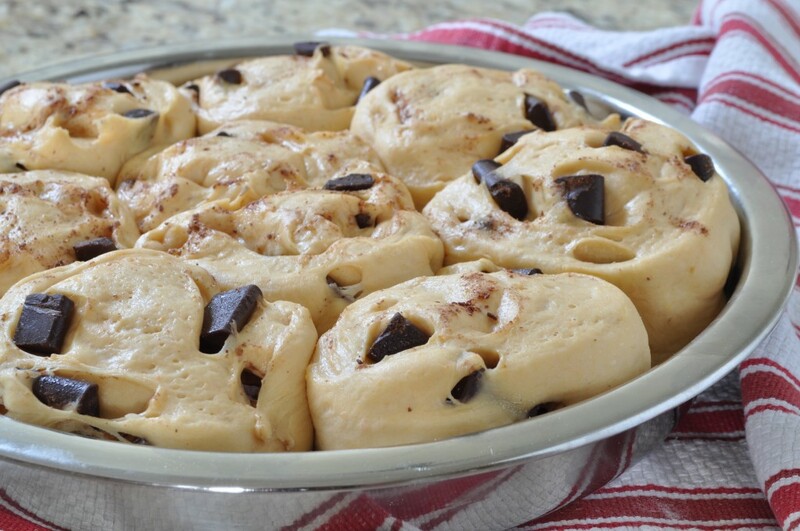 I envisioned studding tender, golden dough with a healthy dose of chocolate chunks, and then pulling a pan of warm, spiraled buns oozing with chocolate out of the oven. However, as I didn’t want to use brioche (because of my mother’s egg allergy), I determined to work out a sweet potato version of my favorite pan bread recipe instead. I was slightly apprehensive about its chances for success, but the dough turned out beautifully smooth and silky, with a pleasing faint orange tint. Emboldened, I loaded it down with chocolate chunks, cut it into thick slices, and arranged the buns in a round cake pan. After they came out of the oven, I brushed the buns with a little melted butter to make them shine, and then impatiently waited for them to cool off enough for me to try them. Oozing? They certainly were that. And the dough had baked up delicate and fluffy, the kind that tears into long, feathery strips whenever you try to pull a piece off. It also had the lovely golden hue that Beranbaum had promised. However, you don’t really taste the sweet potato. Just like you don’t really taste the carrots in carrot cake. It adds moisture and color and a certain mysterious something, which you probably would never identify as sweet potato, yet is definitely there. An autumnal fragrance, an elusive nuttiness. It’s hard to describe . . .
Well, there you have it! You can’t get a much better endorsement than that. Mix the yeast into the warm water, and sprinkle a pinch of granulated sugar over the surface. Let stand until bubbles are beginning to rise to the surface, about 5 minutes. 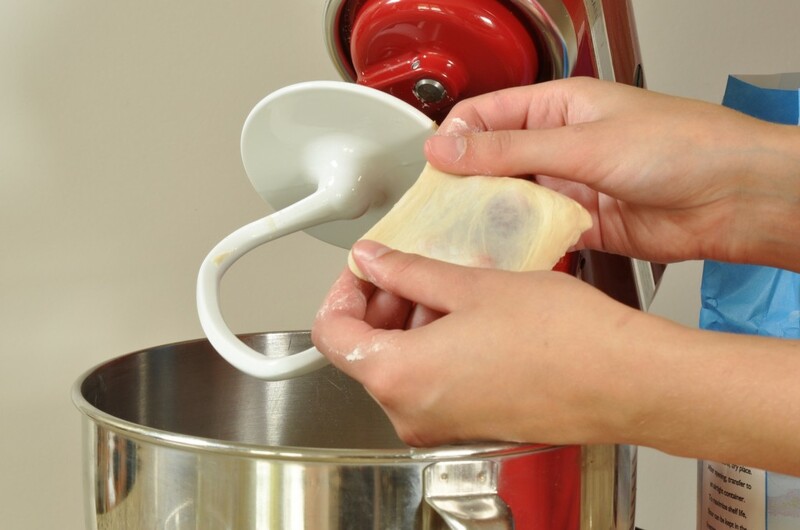 Combine the yeast mixture, the flour, and the milk in the bowl of a stand mixer fitted with the dough hook attachment. Mix on low speed until the mixture comes together to form a ball, about 3 minutes. Remove the bowl from the mixer and cover with a kitchen towel. Leave the dough to rest for 30 to 45 minutes. Return the bowl to the mixer. Add the salt and sugar and beat on low speed until they are incorporated into the dough, about 3 minutes. 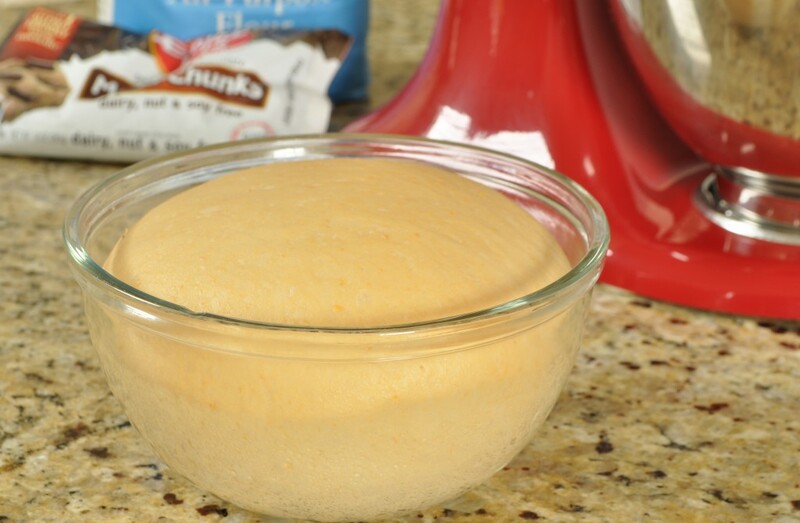 Increase the speed to medium-high and mix for another 8 to 10 minutes to develop a strong, elastic dough. To test the strength of the dough, use the “windowpane” test. 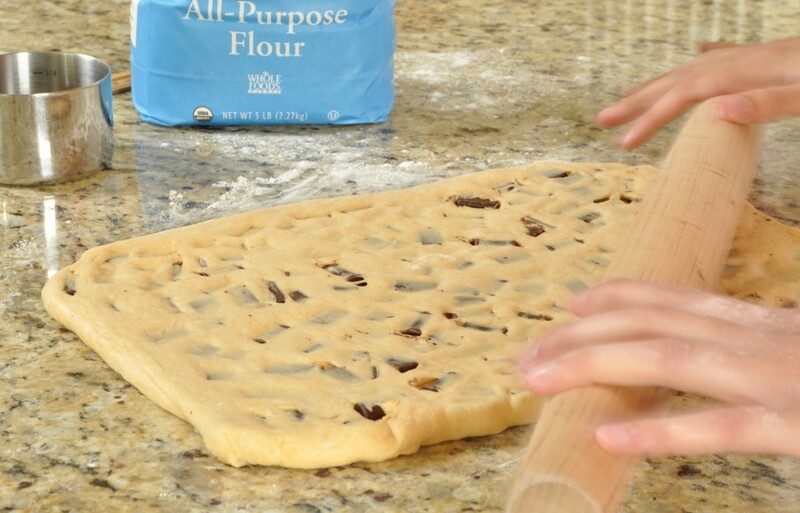 Flour your fingertips and pinch off a small piece of the dough. Then use your fingertips to lightly pull and coax the dough out into a thin round. 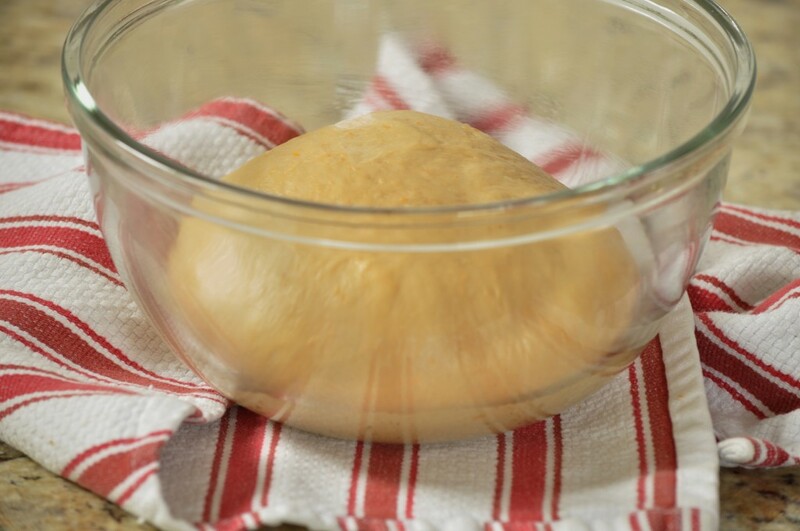 If the dough has been mixed sufficiently, you will be able to stretch it until the center is thin enough to see light through, without the dough tearing. Turn the speed down to low again, and slowly beat in the softened butter and the sweet potato puree, adding them in small increments. It takes a while for the dough to absorb the butter and sweet potato, at least another 6 to 8 minutes. At first, it will look like you’ve simply succeeded in turning your beautiful, stretchy dough into a slippery mess, but persevere and it will come together. Oil a clean bowl and transfer the dough into it. Cover with a kitchen towel and let rise for an hour and a half, until puffy and doubled in size. 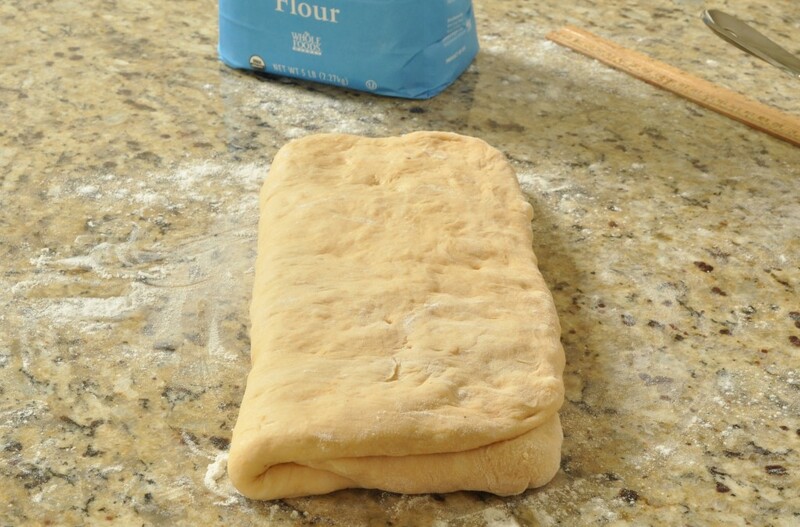 Roll the dough out into a 9-x-12-inch rectangle. 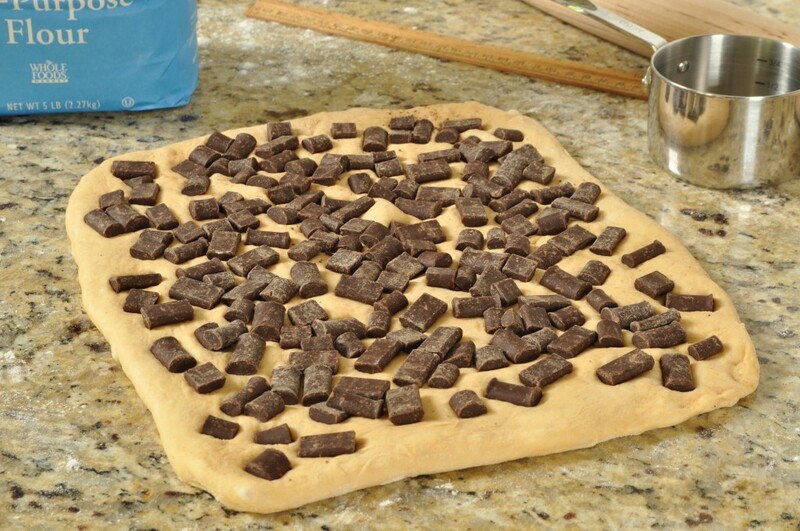 Sprinkle the chocolate chunks evenly over the surface and press them securely down into the dough. Fold up the rectangle in thirds, like a letter, enclosing the chocolate inside. 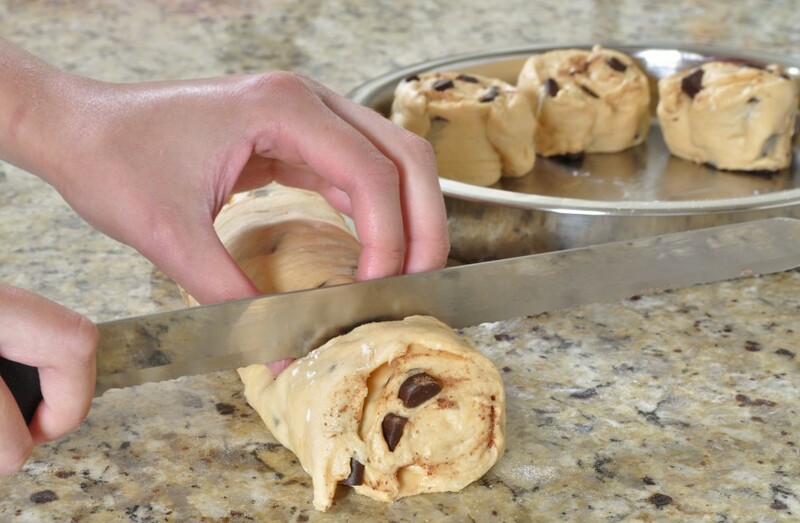 Roll the dough out into a 9-x-12-inch rectangle again. 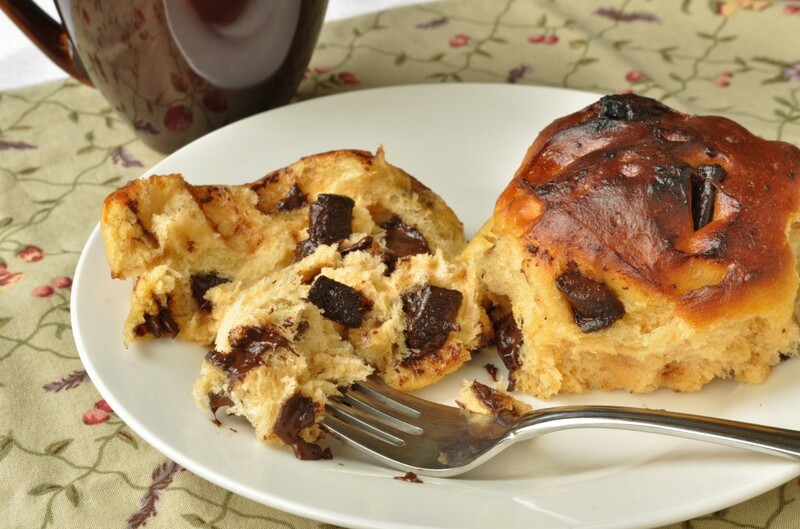 Don’t panic when the chocolate chunks start breaking through the dough. They’re supposed to do that. 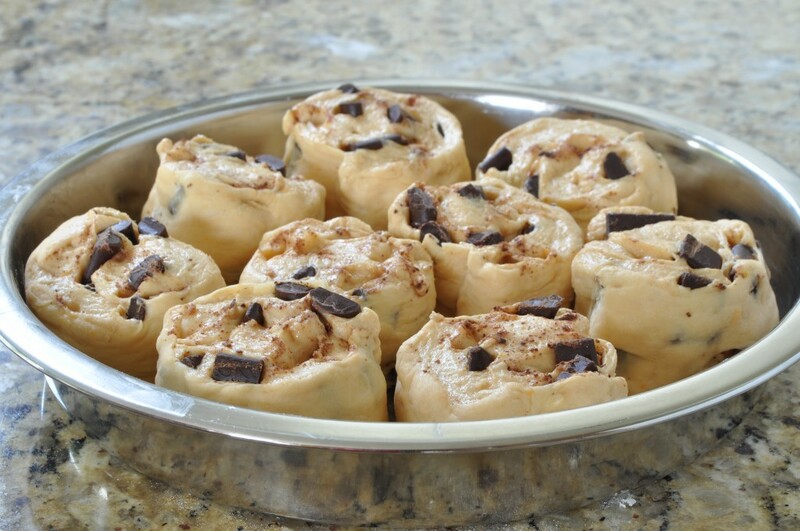 Roll the dough up into a tight cylinder and slice into nine 1 ½-inch thick rounds. Make sure to use a sharp serrated knife with a thin blade and a long sawing motion in order to cut neatly through the chocolate chunks. And don’t press down on the blade until the very end (when you’re separating the round from the rest of the cylinder), or else you’ll tear some of the chocolate chunks out of the dough. Arrange the rounds in the prepared pan, seven around the perimeter and two in the center, spacing them evenly apart. Cover and let rise until the buns are puffy and nearly doubled in size, 1 to 1 ½ hours. An impression made with a floured fingertip should not bounce back. Preheat oven to 375ºF. Bake until the buns are golden-brown on top, 25 to 30 minutes. Remove to a wire rack and brush with the two tablespoons of melted butter. Serve warm or at room temperature. I prefer them warm, when the chocolate is still molten and oozing. To make the sweet potato puree: Peel and dice a medium-sized sweet potato. Place the chunks in a microwave-safe bowl, pour in a little water, and cover with plastic wrap. Pierce a few steam vents in the plastic wrap and microwave on full power until the flesh of the sweet potato is soft and easily pierced with a butter knife, 5 to 7 minutes. Run the cooked sweet potato through a food mill or a potato ricer to make a smooth puree. If you have neither a food mill or a potato ricer (like me), you can use a stiff rubber spatula to push the flesh of the sweet potato through a mesh sieve. This last option takes a bit of elbow grease and a lot of patience. I love the step-by-step photos because making sweet buns can be quite daunting. The sweet potato addition looks great. Thanks for entering into this month’s We Should Cocoa. Thank you, Ness. You gave us a great challenge. A healthy version of pain chocolat, I think I will have to make these soon, they look beautiful. Yes, all the antioxidants in the sweet potato and dark chocolate are definitely good for you. So feel free to indulge! Do let me know how they turn out if you make them. Thanks and have a wonderful weekend. 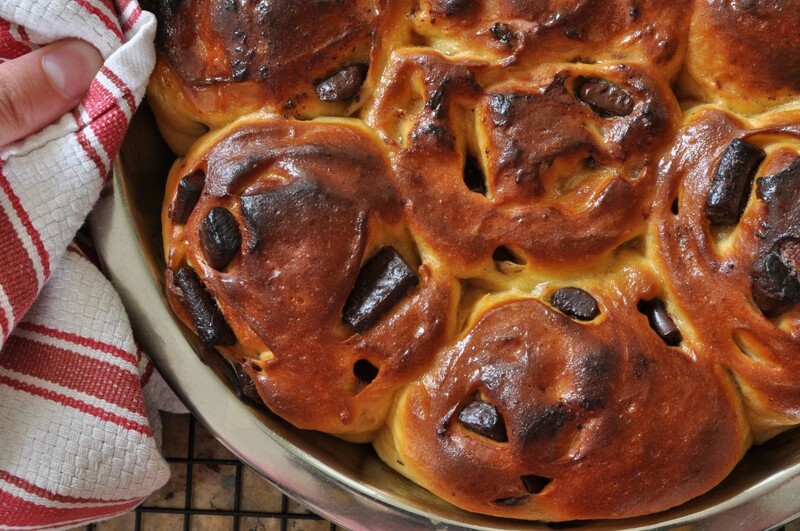 Oh yes, I love the colour of those buns and that certain elusive something has me very keen to try them now, especially if they are even better than pain au chocolat 🙂 Fabulous entry to We Should Cocoa, thank you. Thank you, Choclette! And do try making them on some dull, drizzly evening–I assure you they will make your day. I can’t wait to see what the We Should Cocoa challenge for next month is! These look so interesting and delicious! 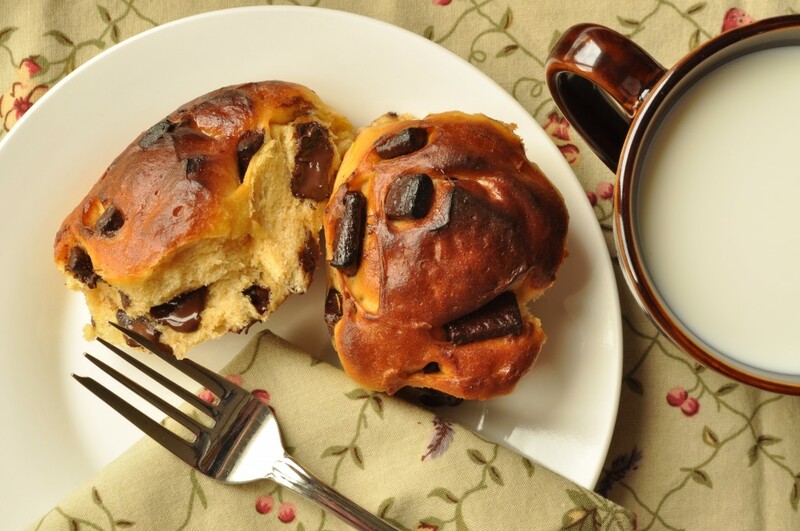 As I sit here, sipping my “cuppa” tea, as the Brits would say, on a cool and rainy autumn day, I cannot help but think that the sweet potato-chocolate buns would be a fantastic companion to my hot drink. Your narrative set up a nice mental image, leading up to the actual recipe. I also enjoy the visuals that you posted throughout the narrative to give extra detail. I look forward to getting new and exciting recipes from you. Though I love to cook, I am no baker, but your blog may change that one day! These look really wonderful. I like how you walk through each step in your posts and show the progress. From the photography to the imagery you create, it definitely make a person want to give it a go. 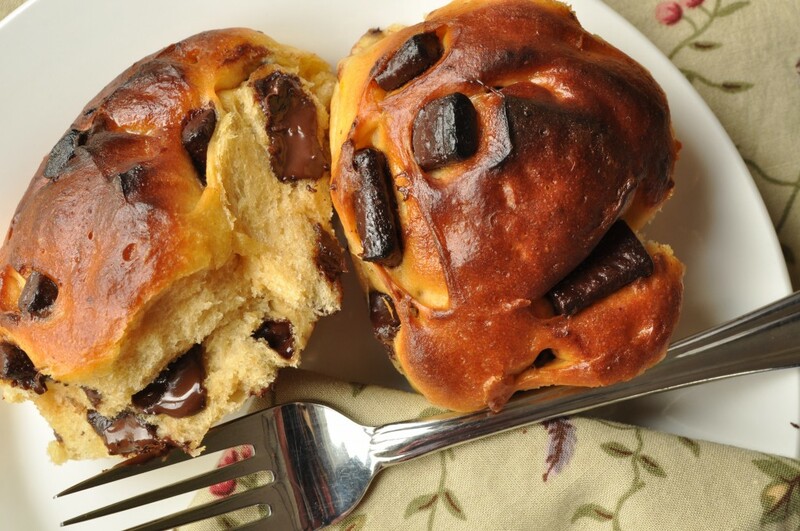 I’m a huge sweet potato fan and would never have thought to mix them with chocolate in a bun. I like to keep an eye on new ways of using healthy ingredients, too. This may be something I have to try for the holidays. Thanks! Thank you, Beverly. I think these buns would be a big hit at the holidays; they taste indulgent, while still managing to be fairly healthy. And that’s something that will always be appreciated at the holiday table!